With over 100 movie theaters in operation and roughly 300 films running in any given week throughout the city, from blockbusters to arty revivals, Paris is without little doubt the world's most ideal city for cinephiles. Ducking into one of these charming temples to celluloid is a great way to pass time, especially when it's rainy out in Paris. But it's also a way of life: Parisians go out to the cinema far more than most urban-dwellers; the age of Netflix and other streaming services hasn't done a whole lot to dampen their enthusiasm for the "seventh art", as the French call the film medium. Before you sink back into your seat, take note: in Paris, popcorn and other crunchy snacks are often considered a noisy annoyance, interfering with the movie experience. Unless you want to receive unwanted annoyed glances, consider choosing quieter snacks. The Cinémathèque Francaise is a high institution in the Paris film world. The 70-year-old film center recently moved out of cramped quarters in Northeastern Paris and into a magnificent left-bank building designed by American architect Frank Gehry. La Cinémathèque has shown over 40,000 films in the course of its history. Programming packed with revivals, thematic festivals, and directorial tributes. The center also features a large cinema history museum worth seeing. Built in 1938, "Le Champo" is one of the Latin Quarter's most star-dusted spots. The cinema, a favorite among students at the Sorbonne just a block away, has hosted premieres for French directors like Marcel Carné and Jacques Tati. The Champo is well-known for its memorable retrospectives. It has programmed homages to Nouvelle Vague cinema of the 60's, Tim Burton, Claude Chabrol and Stanley Kubrick. Right next door to the Champo on the famed Rue Champollion is another Latin Quarter favorite: Le Reflet Medicis. The venue is broken into three distinct theaters with separate programming. Le Reflet draws crowds for its film noir revivals and its focus on some of the best independent cinema from around the world today. Original-version films in English are shown frequently here. You can enjoy a drink and ponderous conversation at the dimly-lit bar across the street also called Le Reflet. 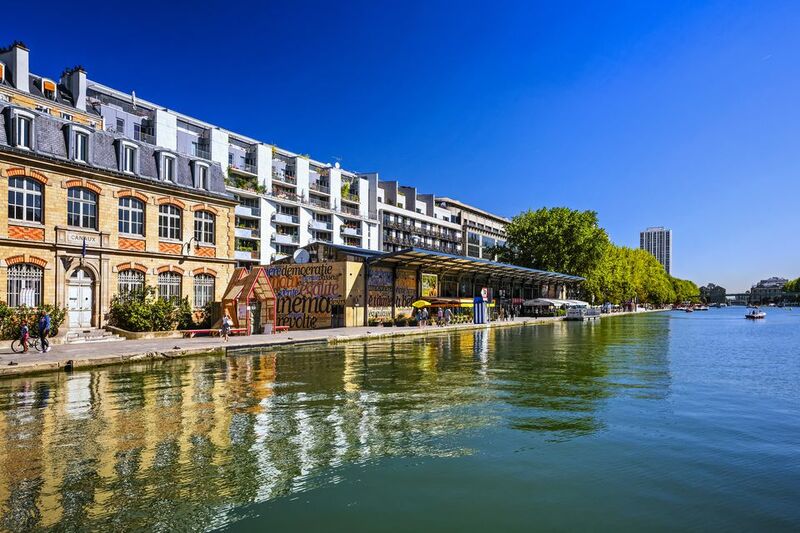 Mk2 Quai de Seine and Mk2 Quai de Loire are recent sister cinemas that face each other across a canal known as the Bassin de la Villette in Northeastern Paris. The theaters have been credited for a cultural revival in the formerly seedy 19th arrondissement. Village-like ambiance meets multiplex comfort. With your movie ticket, you can be shuttled in a tiny white boat across the canal. Plenty of English-language films are shown here. Cafés, restaurants, and multimedia shopping await you, too. Tucked in a corner of the massive Centre Georges Pompidou in central Paris is a cinema well-known for its tributes to great directors and thematic festivals. Recent retrospectives have included homages to Martin Scorsese and Jean-Luc Godard, as well as a look at films produced by students at the Cal Arts film school. Come see a movie here before or after visiting the stunning permanent collection at the National Museum of Modern Art. La Pagode is one of the city's most sumptuously designed theaters. Located in the heart of the chic 7th arrondissement, close to the Bon Marché department store, La Pagode is housed in a 19th-century building whose style mimics a Chinese pagoda. It's a perfect spot for a romantic night at the cinema. Inside, a cool green terrace for tea and a black cat named Licorice sprawled over the programs adds to the charm. Revivals and thematic festivals. English-language contemporary and historic films in Original Version are also frequent here. Note: The cinema is currently closed, sadly, due to a rental dispute between the owners and the cinema operator. An investor acquired the cinema in 2017 with hopes of reopening it in a few years.